The Detroit Pistons managed to win their fourth straight home opener on Wednesday night, narrowly outlasting the Brooklyn Nets in a 103-100 slugfest at Little Caesars Arena. We saw some of the good and we saw some of bad. When healthy, the Pistons knew what they were getting when they dealt for Griffin last February. And it was on full display as he shouldered a brunt of the load for the Pistons, putting up 26 points (8-17 from the field), eight rebounds, and six assists while registering a +9 rating. He was unafraid to take the ball to the basket and found himself on the free throw line 11 times. Griffin’s awareness of the floor was also on display with his passing and vision of the floor. The Pistons offense was always going to rely heavily on Griffin going into this season. They now see that, with him, it is in hands that are more than capable. Don’t let the 19 points fool you. Jackson did not look great on opening night. There were multiple instances of Jackson holding onto the ball for too long, thus melting the shot clock away and forcing himself into a highly contested, poor shot. And he’s got the 7-20 from the field line to prove it. And nine of those shots came from beyond the three-point arc, where he made only two of them. Many of these came in the fourth quarter when he clearly did not have his rhythm from outside and created more possessions for the Nets to get back into the game. If he can learn to quell the “hero ball” mentality, the Pistons and Jackson would be a much happier marriage. Andre Drummond did what he does best, cleaning up 20 rebounds (including nine on the offensive glass) and recording 24 points, including his first three-pointer of the new campaign. This is the kind of production the Pistons will need from their all-star center. As well, the Pistons received a solid showing from backup center Zaza Pachulia, who finished the night with six points, seven rebounds, four assists, two steals, and a block. In addition, he brought defensive toughness and grit that has been missing from Detroit for some time. If he can keep that toughness in check, in the light of his track record, he could be a valuable asset going forward. Most troubling was the lack of defense. Most notably there was weakness defending in the paint, where the Nets scored 66 of their 100 points. Of Caris LeVert’s 27 points, 20 came from shots made inside of the key. Likewise, Spencer Dinwiddie’s 20 points from the field all came from the paint, while Davis and Joe Harris added a combined 18 more. The Pistons have the bodies in Drummond, Griffin, and Pachulia to defend the rim. But a large part also comes from the lack of defense on the perimeter that allowed so many baskets on the drive. This was due, in part, to the absences of typical starters Stanley Johnson and Reggie Bullock. But the lack of defensive depth is a slight concern that coach Dwane Casey would do well to address as he can. At the end of the day, a win is a win. And the Pistons are off on the right foot as they look to make their return to the playoffs. I evaluated historical data, roster and performance last season in actual wins and made my over/under pick for the Chicago Bulls in 2018-19. The Bulls’ rebuild got off to a promising start, winning 27 games, more than anyone expected. Rookie forward Lauri Markannen flashed some star potential, shooting guard Zach LaVine got his feet wet after recovering from ACL surgery and point guard Kris Dunn surged when healthy. Signing Chicago native Jabari Parker, the No. 2 pick in the 2014 NBA Draft can be risky because he’s torn the ACL in his left knee twice but the Bulls hope he can return to his 2016-17 form, when he averaged 20.1 points, 6.2 rebounds and shot 49 percent from the field, all before suffering the second ACL tear. Now that the Bulls added Parker and first round pick Wendell Carter Jr. they’re planning to move forward just one year of trying to be bad. The Bulls have some pieces in place and it’s time to turn them loose and see what happens. The biggest question marks are defense on the wings, whether Parker can play full-time small forward and the overall chemistry but if this team is still trying to win games late in the season, it will be progress. The front office went all-in for at least one more year of a young and intriguing roster that has immense offensive potential but too many obvious defensive deficiencies. This decision will shape the season but there’s a lot to like. Jazz Sports set the season win total for the Bulls at 28.5. 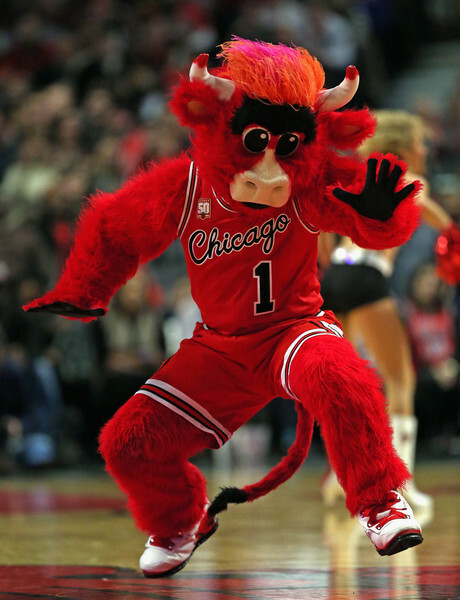 Playoff contention in the Eastern Conference is not out of the question and it could be a fun year in Chicago so my pick is Bulls Over 28.5 wins at -140 NBA odds. Chicago won 27 games last season while tanking, with Dunn and LaVine injured for long stretches and without Parker and Carter Jr., so winning at least 29 games will be no problem. Last season Jimmy Butler averaged 22.2 points, 5.3 rebounds and 4.9 assists in 59 regular season games and the Timberwolves were 37-22 with him in the lineup and 10-13 without him but chemistry issues with Karl-Anthony Towns and Andrew Wiggins and Butler’s desire to sign a lucrative extension prompted him to seek a meeting with head coach and team president Tom Thibodeau and although Butler is very close with him, he just requested a trade from Minnesota and has given them a very short list of teams he would be willing to consider a long-term extension with if he’s traded there. Butler can opt out of his current contract after this season and become a free agent and it’s been reported that he will consider re-signing with the Knicks, Clippers or Nets. The Timberwolves made Butler the centerpiece of their rebuild after trading Zach LaVine, Kris Dunn and Lauri Markkanen to the Bulls for him in the NBA Draft on June 22, 2017 but the team barely made the playoffs and fell short of expectations. Now Butler is on his way out after just one season in Minnesota, so the Timberwolves basically gave up Zach LaVine, Kris Dunn and Lauri Markkanen for 59 games of Jimmy Butler. As for the Bulls, head coach Fred Hoiberg declared training camp, which starts on September 25, to be an “open competition” for starting jobs, though a lineup of Kris Dunn, Zach LaVine, Jabari Parker, Lauri Markkanen and either Robin Lopez or Wendell Carter Jr. is a given, barring injury, so it’s hard to argue that the Bulls won this trade. The media and Bulls fans still talk about it, I wasn’t happy about the Butler trade, I really wanted him to win an NBA Championship in Chicago but LaVine, Dunn and Markkanen won me over with their play and the team is heading in the right direction. Thibodeau and the Timberwolves are sending mixed messages on whether the team wants to trade Butler. “The owner’s trading him,” one board of governors attendee told ESPN on Friday. “That was made clear. It’s just a matter of when.” Many board attendees at the board of governor’s meeting in New York are convinced that the team and Taylor do not want prolonged internal fighting with Butler, preferring to trade him sooner than later. With the help of Butler, the Timberwolves ended their 13 year playoff drought, and to some, the news that Butler wants to be traded got some people off guard. However, Andrew Wiggins brother, Nick responded with jubilation with a Twitter post that said “Hallelujah,” which has since been deleted. A report came out saying that star Karl-Anthony Towns told the team he could not co-exist with Butler along side. Furthermore, Towns reportedly will not sign his rookie extension until the team resolves the issue with Butler according to Darren Wolfson of 1500 ESPN. There are three teams that Butler would like to end up with but according to ESPN, the top team he wants to join are the Clippers. “Butler’s ability to partner on the Clippers with a second star player in a deep summer free-agency market holds a strong appeal to Butler, league sources said.” The Clippers have two max contract slots available for next July and are emerging as the favorite to land Kawhi Leonard when he is slated to be a free agent next summer, per league sources. In his first year with the Timberwolves, Butler averaged over 22 points a game, had a career best two steals a game and averaged nearly five assists a game. The Wolves have some outstanding talent, but Butler is the best player on the team. The team does better with him on the court compared to when he is not playing. The biggest issue Minnesota has to deal with is, do you take a player who makes a difference on the court in key stats but has an issue co-existing with other players? Or does the team get rid of a player who is not considered a great teammate but lose points, assists and rebounds without his presence on the court? It would depend on what the Wolves would get in a trade. ESPN.com ranks Butler at NO. 14 in best players in the NBA, he was previously at NO. 11. His ability to ignite the home crowd at important moments are what makes him a legit star. Last season, Butler and LeBron James went at it back and forth in Cleveland and he is one of the most exciting players to watch in the NBA. Wherever he plays this upcoming season, Butler will surpass 10,000 points in the regular season. He doesn’t leave anything on the court, if he was a power forward, he may not be what Shaq was, but he would impose his will on defenders close to the way Shaq did in his prime years. Note: This is still a developing story so information is still coming out. This off-season has been a disaster for the Minnesota Timberwolves. It was capped by star player Jimmy Butler requesting a trade from the Timberwolves. In the meeting, which took place Tuesday, Butler gave the T-Wolves a list of three teams of which he would re-sign with if he were traded to. That list included the Brooklyn Nets, New York Knicks and Los Angeles Clippers. ESPN’s chief basketball reporter, Adrian Wojnarowski dropped another nugget of information later Tuesday by saying Butler will try to work his way out to the Clippers any way he can. It came out today from Woj as well that Minny has been declining trade requests from other teams, saying they are going to keep Butler. Ugh, it always seems (as a Timberwolves fan) once we get a star player, drama occurs. Can’t we enjoy success for once? It has been well chronicled the tenuous relationship between Butler and the “Timberpups” (AKA Andrew Wiggins, Karl-Anthony Towns). Information has been leaking all summer about how Jimmy is not in good favor with the front office of the T-Wolves as well. In fact, in early July, the T-Wolves handed Jimmy a contract extension, and he declined. Jimmy said he wants to be dealt by Monday, which is the Timberwolves media day. As of right now, it does not look like he will be dealt by then. This saga drags on, and it will be interesting to see if Jimmy is dealt by the start of the regular season, and if not, will he play? You know as a kid, clowns were always really creepy? Well, clowns have a bit of competition these days. 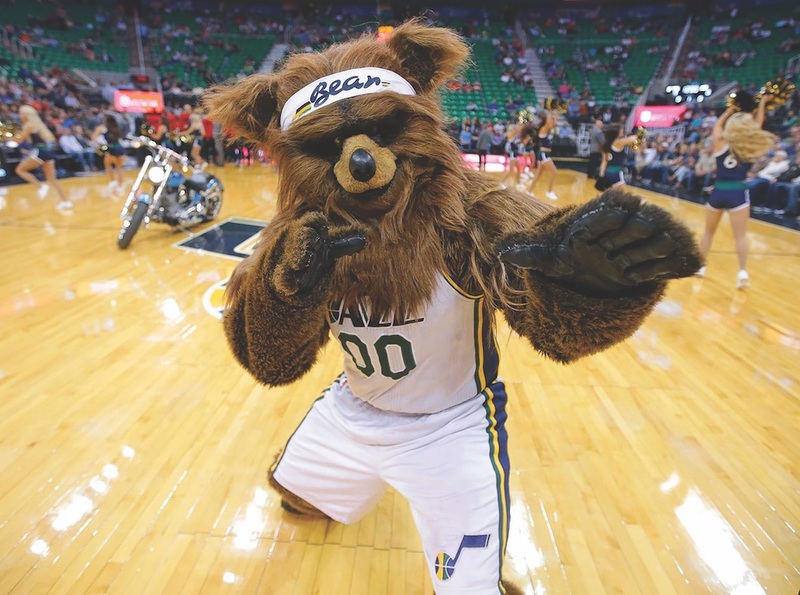 Mascots are a fun and time honored tradition in sports, but in the NBA, some teams have gone the extra creepy, Five Nights at Freddies route. 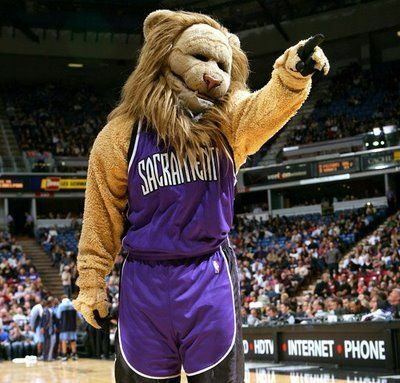 Here are my top 10 weird NBA mascots…. This guy right here is somewhat disturbing. For one, he doesn’t look anything like a bear, and another thing is that creepy smile he has on his face. When you think of sports mascots, you don’t think of a reject from Disneyland. Plus his name, what exactly is he going to clutch? Hmmm? This one is bad, very very bad. It looks like a $20 Halloween costume you buy at one of those temporary costume shops that springs up in old super market buildings. What’s even worse is the creepy look that is permanently adorned on his face, a look of that no matter how cheesy, still can send chills into the souls of every person who sees it. Oh the harmless dog, why would this be creepy? Well, if you have vision you can see why. 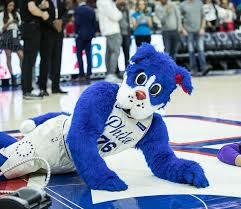 From his awkwardly shaped face, to his eyes that seem to look right into your heart, the 76ers mascot is one that we could do with out. When your team name is a style of music, finding an appropriate mascot is a challenge. Whoever came up with this one though hit a sour note. He looks like a possessed Chewbacca. 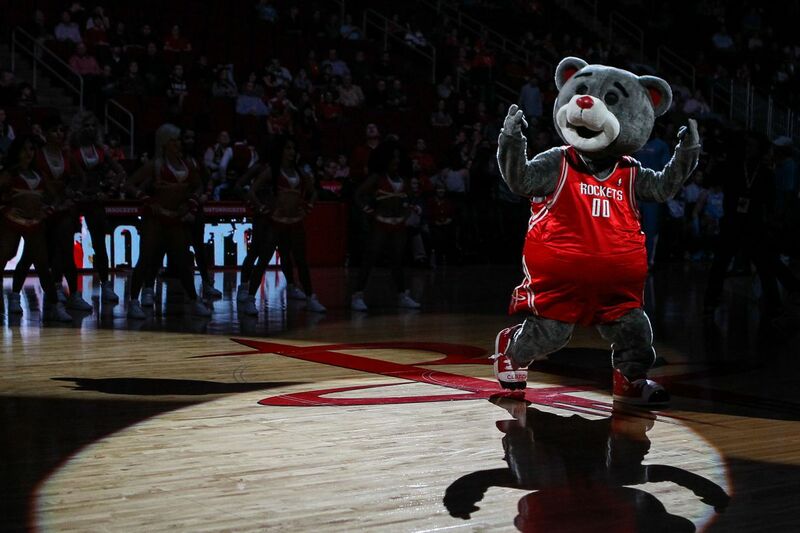 Mascots should not look like something they chase on Monster Quest. I’m starting to get the feeling that some of these are just recycled movie costumes. Gorilla looks like an extra from Planet of the Apes, Jazz Bear is Chewbacca and this guy would be an evil Lion from the Wizard of Oz. The lack of visible eyes and the odd expression on it’s face are the things of nightmares. Imagine running into this walking home at night……. You can speculate why LeBron left Cleveland, but we know the real reason. This insanely creepy mascot. I mean look at it. 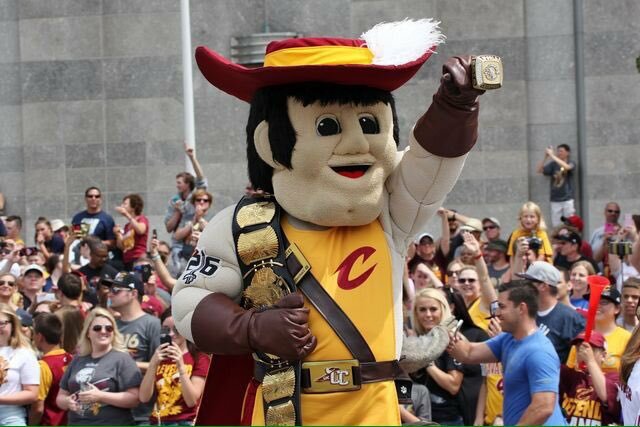 I don’t know what circle of hell this thing came from but I’m sure most Cavs fans would like it to return there. As if they aren’t going to suffer enough this year. For those of you who understood the Five Nights At Freddie’s reference from the beginning of this article, this one fits it perfectly. Those glowing green eyes look like something you would see in a cheap horror movie, cheesy enough to laugh at yet still terrifying. 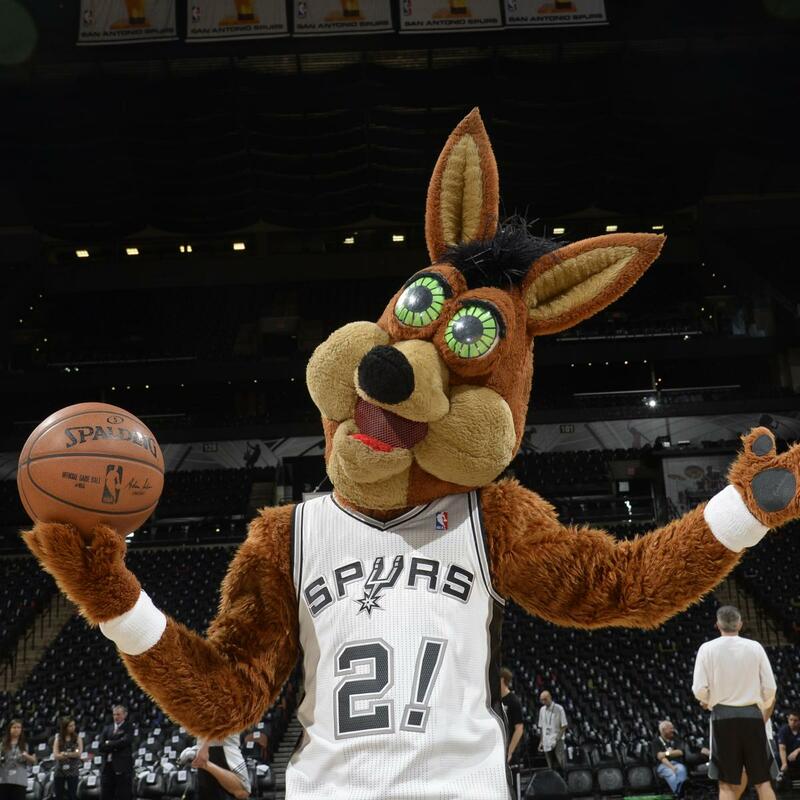 Being the Spurs mascot, you can’t help but wonder what he does with a set of spurs in his off time……maybe we shouldn’t. Picture if you will, you’re walking through the Wisconsin woods, clouds obscure an already dim sun… You hear a rustling in the black trees, you stop and look around, already you have made a fatal mistake. As you stand there in fear, he pounces on you…..congratulations, you have just entered the twilight zone….. I think Rod Serling would approve. There is so much wrong with this, I could do a whole article on it. 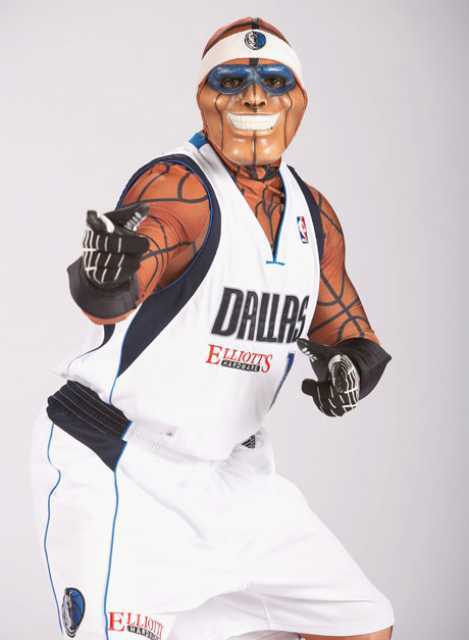 From the scary face, to the basketball skin, in the immortal words of the internet, “this ain’t it.” We all know the Mavericks gave up on winning a long time ago, but now we know where they put that energy….into scaring the life out of their fans. As we head into the Final month of no basketball, ranking players is going to get more and more fun, so today I go through and rank who I think are the top 10 point guards heading into the season…..
Murray is heading into his 3rd season as a pro, and he is still trending upwards. He made significant gains in almost every stat from his rookie year to last year and will look to improve even more. Nearly doubling his ppg average, (9.9 in 2016 to 16.7 in 2017) and taking up his FG, Rebound, and assist numbers, Murray is a super star on Denver’s offence and will likely get that same recognition this year league wide. Like Murray, Bledsoe saw some major improvement in the 2017 season, taking many of his stats up (17 ppg, 47% FG.) In 2017, he moved cities, leaving the Suns after 5 years. 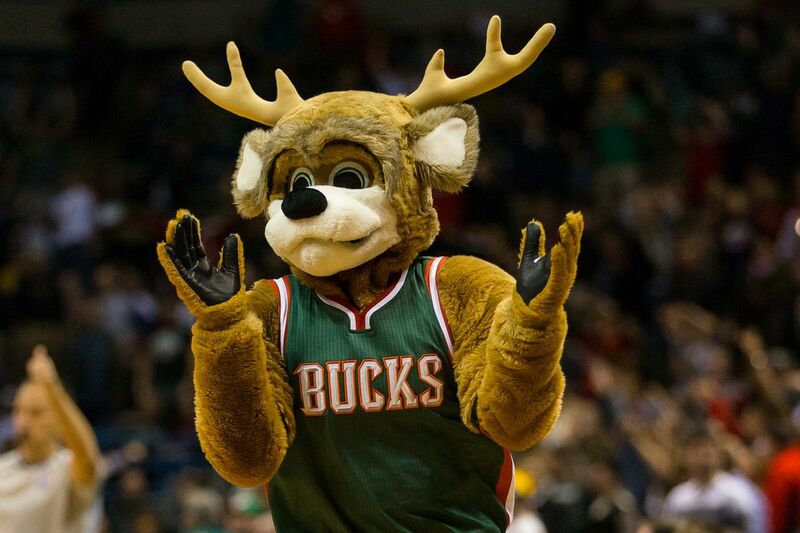 As the Bucks start off a new coaching regime, Bledsoe will likely shine even brighter. If not for injuries, Wall would be much higher on this list. He has been to 5 All-Star games and has the skills to rank much higher. But missing 41 games will no doubt take some kind of toll on him. If he can get back to numbers like we saw in 2016 (23 ppg, 10 assists, and 45% FG shooting) then Washington is bound for a good run in the East. After almost a decade in the league, Holiday had one of his truly best seasons last year. He threw up career high scoring numbers (19 ppg) and also chipped in 6.0 assists, 1.5 steals, 1.5 triples and nearly a full block every game. Playing along side star Anthony Davis no doubt helped his numbers as well. Lillard had one of the best season overall of his career in 2017-18 and received 1st Team All-NBA honors. As the face of the team, Lillard came up clutch so many times and helped Portland reached the number 3 seed in the West. Even though Portland, came up short in the playoffs, getting swept by Utah and Lillard’s numbers looking far worse then they had all year, the Blazers are in prime position to make another run with Lillard at the helm. Oh man, the bad luck Chris Paul had when so close to the Finals. An injury in Game 5 of the Western Conference Finals was a turning point in that series. Health played a role in Paul’s less then spectacular season in Houston. Once know as the “Point-God,” Paul missed a career high 24 games and the last 2 of the WCF. He averaged just 7 assists, the lowest number since his rookie year. That said, a return to health, plus playing on the same team as currant MVP James Harden, and his still elite level skill set should have him see a major up swing in 2018. Say what you want to about Russell Westbrook, bu you can’t knock his game on many levels. He has averaged a triple-double over the last 2 years with 25.4 points, 10.1 rebounds and a league-best 10.3 assists per contest. His main flaw is his selfish play sometimes, but with another year playing with Paul George coming up, and the team getting better by releasing Carmelo Anthony, you can expect Westbrook to become more of a team player. If Kyrie had stayed healthy and played like we know he would have, many things would be different right now. One, the Celtics would likely have been in he NBA Finals, and two, he would be number 1 on this list. After having surgery to repair his knee, an infection is what ended up finishing his season. The time he did play though, he was great. He racked up 24 ppg, shot 49% from the field, and averaged 6 assists. Next year returning health and with one of the best young teams in basketball should make Boston the team to beat in the East. Streph shows few of slowing down. Playing on a team of all-stars, Curry is free of having to carry a team and is therefore likely to have many more years of success. He racked up 26 ppg, shot 46% from the field and an amazing 42% from downtown. The thing to watch with him is the lingering ankle issues that have plagued him his whole career and cost him 31 games. The Warriors were able to go on that stretch fine with all star Kevin Durant leading the charge, that said, Curry is still the most important member of this franchise. With out him, the offence slows down quite a bit, and while still able to win, Curry makes it all so much easier. He’ll likely get a shot at a 4th ring this season. Thank you for reading! Hit me up on twitter @GeeksportJosh and let me know what you thought! Phoenix and Houston are reportedly close to a four player swap.The deal would give the Suns a starter at a position of need yet leave them with a void at another position of need. The proposed deal would send forward Ryan Anderson to the Suns and point guard Brandon Knight to the Rockets. Phoenix also would send former first-round pick forward Marquese Chriss to Houston and the Suns would get guard De’Anthony Melton in return from the Rockets. If the trade goes through as expected, Anderson would essentially be the starting power forward that Phoenix needs. He averaged 9.3 points last season and has two years left on a four-year, $80 million contract he signed with the Rockets in 2016. The Suns, provided no money changes hands along with the players would leave Phoenix on the hook for the remaining salary. According to sportrac.com Ryan Anderson signed a 4 year / $80,000,000 contract with the Houston Rockets, including $80,000,000 guaranteed, and an annual average salary of $20,000,000. In 2018-19, Anderson will earn a base salary of $20,421,546, while carrying a cap hit of $20,421,546 and a dead cap value of $41,686,183. Knight, looks to be the biggest loser in this particular trade. Brandon, who missed all of last season with a knee injury was on track to be fully healthy by the start of the season. 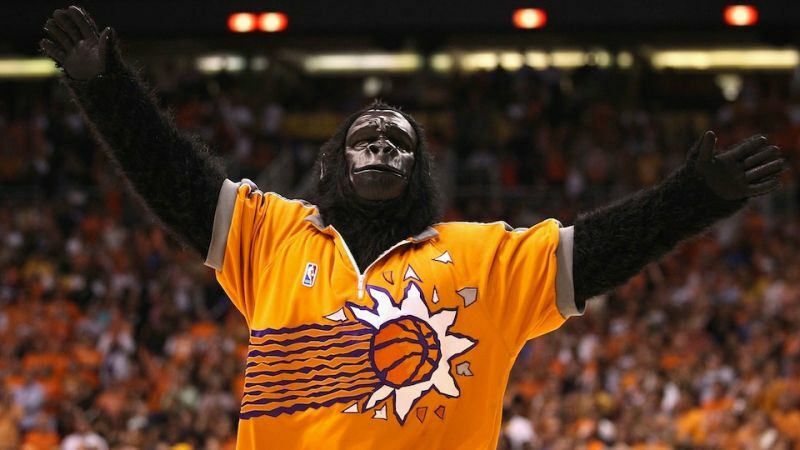 So much so, that he was pegged to be the starting point guard for the Suns. Now, he figures to see time as a backup to Chris Paul in Houston. The trade does give the Suns a starting power forward but it would also leave Phoenix searching for a starter at the point guard position with no one on the roster ready to assume that responsibility. Honestly, more than anything this may be a dump of a trade to get rid of a disappointing player. That player would be the 6-foot-10 Chriss, the eighth overall pick out of Washington in 2016. The Suns had high hopes when they drafted him. He also gave them reason to continue those hopes with his first year production. But sadly his average dropped from 9.2 points as a rookie to 7.7 points last season. But he is just 21 years old and a change of scenery may do the young man good. Let’s look at some stadiums, shall we….. Thank you for reading! Hit me up on Twitter @GeeksportJosh and let me know what you think! Also, special shout out to my really good friend Michael Seney for helping me out on this one. Be sure to follow his Twitter @RavenDarkGuy.